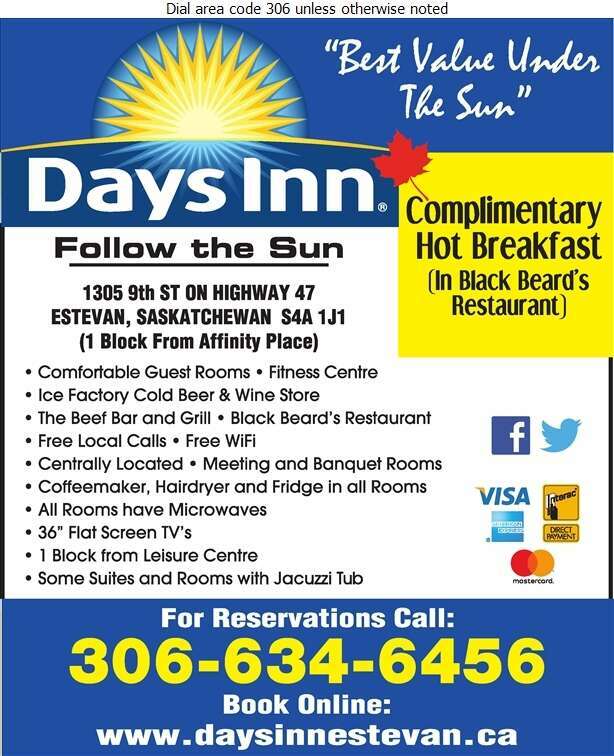 As Estevan's premiere hotel, the Days Inn® Estevan is ideally located close to the Souris Valley Aquatic and Leisure Centre, Spectra Place, Civic Auditorium, Curling Rink and Exhibition Grounds. We are also minutes away from the Estevan Shoppers Mall and downtown. As a guest of the Days Inn, you can expect warm hospitality and clean, comfortable rooms along with all the little extras that will make your stay enjoyable. While staying with us, relax in our hot tub after a workout in our fitness centre. Our guests are invited to join us every morning for a complimentary continental breakfast. Our greatest compliment is for you to return to any Days Inn location or recommend us to a friend.